From marketing campaigns to insight-driven, contextual customer interactions. With so much data at our fingertips, why are marketing campaigns so much less effective today than ever before, at acquiring and retaining customers? It’s because consumers are more distracted, and they’re being marketed to with little relevancy. In order to stand out, you need to deliver personalized and context-driven interactions with each customer. Brands that seize this potential are embracing a Customer-Obsessed Marketing Model around core competencies: mindset, talent, process, and insights. And they are assembling what Forrester calls, Contextual Marketing Engines: brand-specific platforms that exploit customer context to deliver utility and guide the customer into the next best interaction. In this webinar, we’ll discuss the Customer-Obsessed Marketing Model and how to build a Contextual Marketing Engine to realize the shift from static product-focused marketing campaigns that target customer segments, to dynamic and contextual customer interactions based on real-time scoring of individual customer data. We’ll focus on the capabilities you need to be successful and how a Customer Data Platform can help fill this essential gap in your current marketing stack. 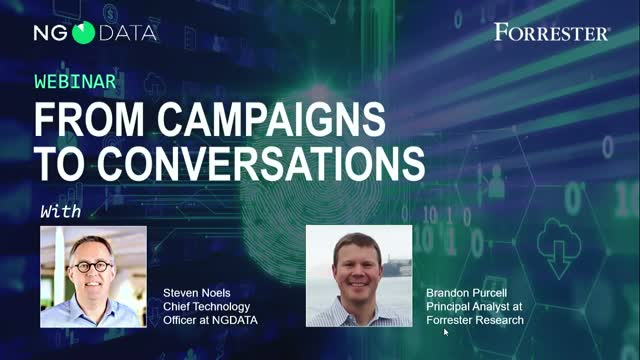 Join our guest, Brandon Purcell, Principal Analyst at Forrester Research, and our own Steven Noels, Chief Technology Officer at NGDATA, for an interactive and informative conversation. • How can the right marketing strategy, processes, teams and technology enable your brand to make the shift to conversational programs. • How brands are currently gaining advantages through contextual marketing. • How contextual customer interactions create value for both your brand and your customer, improving long-term business results. We are now in the Digital Economy, and that means needing the most accessible and actionable customer data. Today’s consumers demand a unified, omni-channel experience provided by everyone they engage with, from their banks to local government. But, it’s impossible for organisations to create this when their data exists in silos. To create that seamless, connected customer experience, you need unified data – and to be able to take action on that data to give meaningful outcomes for your customers. Join Ian Matthews, Data Evangelist at NGDATA, and special guest, Richard Holland, Assistant Director Technology Innovation at London Borough of Waltham Forest, for a dynamic and informative webinar on using big data and analytics to support digital transformation. NGDATA's been busy over the past year building out our vision to help companies modernize and transform their customer relationships. We acquired Eccella, a global digital transformation company, expanded our product and support teams, accelerated our partnerships across the full spectrum of digital transformation, and reinvigorated our intelligent customer data platform (CDP) with a new UI and machine learning capabilities. - Digital Transformation team helps build outcome-focused data and technology infrastructures underpinning a data-driven company. - Intelligent CDP drives increased engagement through real-time, machine learning- optimized engagement for each and every customer. Consumer-focused brands are presented with a unique opportunity to either build compelling customer experiences, or risk squandering funds and frustrating customers with redundant and irrelevant interactions. Success or failure is contingent upon your organization aligning your people, processes, technology and data with your customers and corporate strategy to create a unique competitive advantage through Systems of Insight. Join Gil Rosen, Head of Strategy at NGDATA, and special guest James McCormick, Principal Analyst at Forrester, as they give a powerful and informative webinar on turning your customer data into rich, long-lasting customer experiences. • Understand current consumer industry shifts; how they're being shaped by data and technology, and the impact of adoption or complacency. • Learn how leading organizations leverage Systems of Insight to redefine their strategy and operations, and build meaningful, engaging and valuable customer relationships. • Introduce Forrester's insights and research helping brands understand how insights-driven they really are, and what to do next to build their own Systems of Insights; harnessing their competitive strengths to find, engage and delight the right customers. • Learn how to build Systems of insight using the NGDATA and Informatica platforms. When done right, a data lake can provide your users with easy access to comprehensive data, and support machine learning use cases that have a real impact on your top and bottom lines. In this webinar, we’ll go through an end-to-end data lake and machine learning use case for increasing customer engagement at a retail bank. We’ll provide an overview of the tools, platforms, processes and people necessary for ingesting data onto your lake for data exploration and reporting, as well as the critical next steps for building scalable, machine learning applications for deeper insight and prescriptive actions. Leveraging the AWS-Informatica Quickstart, coupled with NGDATA’s data ingestion accelerators, we’ll show you how to get your data lake up and running in hours instead of weeks. - Learn how to quickly deploy a data lake with an enterprise catalog. - Understand how to leverage your data lake for ML / AI insights using open-source algorithms in a CDP. - Key best practices with Informatica's modern reference architecture. Dan helps data-driven companies and their leaders unleash the power of data to drive intelligent disruption in their businesses and markets. Gil built a global data and analytics consultancy of 100 strong, advising and implementing data infrastructures and outcome focused data initiatives for enterprises. NGDATA helps brands in data-driven industries, such as financial services, telecom, utilities and hospitality, to drive connected experiences. Our AI-powered CDP puts people at the center of every business via Customer DNA, which continuously learns from behavior to deliver compelling experiences for companies, such as Belfius Bank, Innogy and Telenet. NGDATA is headquartered in Gent, Belgium and has offices in the United States, Europe and Asia-Pacific. For more information, please visit www.NGDATA.com. Title: From marketing campaigns to insight-driven, contextual customer interactions.